31 Days of Art: "The Adventures of Alvin Sputnik: Deep Sea Explorer"
You find theatre intellectually stimulating. The winner of the best solo show at the New York International Fringe Festival takes Center Stage at N.C. State in October. “The Adventures of Alvin Sputnik: Deep Sea Explorer” is a one man micro-epic puppet spectacle melding technology and multimedia into a touching story about love, loss and heroism in a post-apocalyptic world. 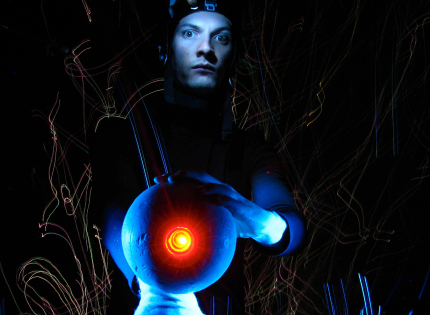 This show was created in Australia and blends mime, puppetry, music and animation in exploring the deep blue sea. The seas have risen, billions have died and those who are left live on farms atop skyscrapers. A last ditch effort to save the human race requires journeying down through the mysterious depths of the sea to find a new place for us to live. These are the dire circumstances surrounding the central hero of this tale: Alvin Sputnik. Having just lost his wife, Sputnik accepts this perilous mission so that he may follow her soul to the underworld where they can be together once more. Playing Oct. 24-27 with weekend matinees. Created for adult audiences, but also suitable for older children. Hosted by the Titmus Theatre in Thompson Hall on the campus of N.C. State University. Parking is free. Cates Avenue has restricted access during campus renovation, so please plan accordingly. All part of “31 Days of Art” in Greater Raleigh!